stevo: doing great, how about you? k~w~m: Heya Don, we're great! don: who wants to make out? fiveyearwinter: I would but I don't take sloppy seconds. don: tim are we ready to rock? tim: shall we go mod? don: i think tim will let the questions rip in just a second..
tim: Don did you want to say a few words before we start, or shall I bring on the questions? 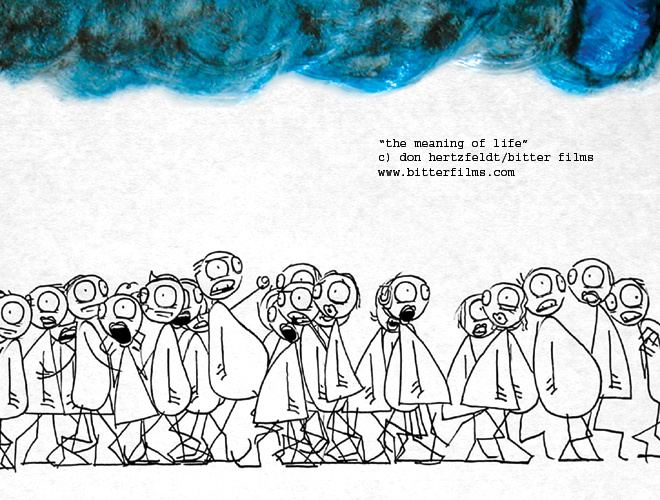 don: the new film is called "the meaning of life"
don: would you like to see a few pictures from the new film? tim: do they look like links on your chat screen? tim: thenorman says: Can we expect another intro/interm/ending to go w/next year's TAS? 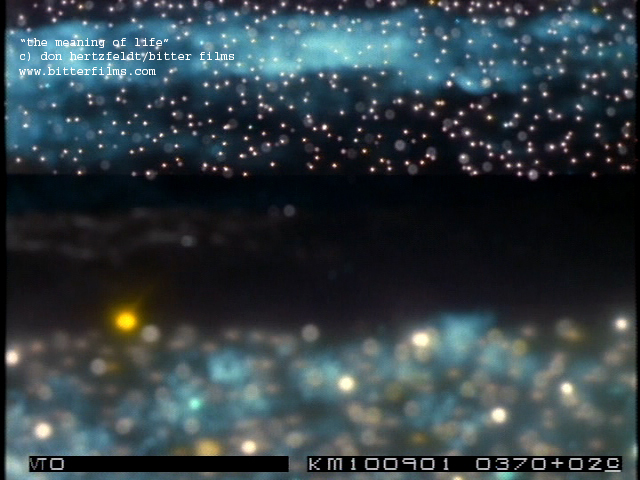 don: i think we'll have a disclaimer at the end of the film, "no computers were used in the photography or animation of this motion picture"
tim: liam says: Will the other 32.5 minutes of "The meaning of life" ever be released? tim: robert says: I think you got everything. tim: monkeyforahead says: okay, I must know, does Meaning of Life have an un-obvious underlying moral and lots of randomness on the surface? or will it be almost serious? tim: shandlanos says: Is the title a homage to monty python? don: i'm not sure how much of a comedy the film will end up being..
tim: doomedmonkey says: What sort of pens do you use? tim: nofetusjesus says: what inspired you to do the film? tim: shandlanos says: Does it rouch at all, directly or indirectly, on your religious beliefs? don: religious beliefs? i don't think so. maybe philosophical beliefs? don: i'm not sure where the film came from..
tim: broken says: Don, I just finished a 51 minute animated movie all by myself, any advice on where to go from here? tim: liam says: What is the meaning of life? tim: the gaucho says: Im going to graduate in 8 months from UCSB film. How important do you feel the degree was to you (w/ the small-print theory and what not)? Did you take any grad school? tim: shandlanos says: Do you expect/hope for an academy award nomination for the new film? tim: monkeyforahead says: is there any particular reason you wanted to do it without computers? tim: thenorman says: What do you do in your spare time---when not working nonstop on TAS, films, etc.? tim: elgee says: What are your plans for the MOL-DVD? Will it be a single, like "Rejected", or does it go into the "Bitterfilms Collection DVD"? tim: zach says: Don, how do you feel about people downloading your movies from KaZaA or Morpheus or other P2P programs? 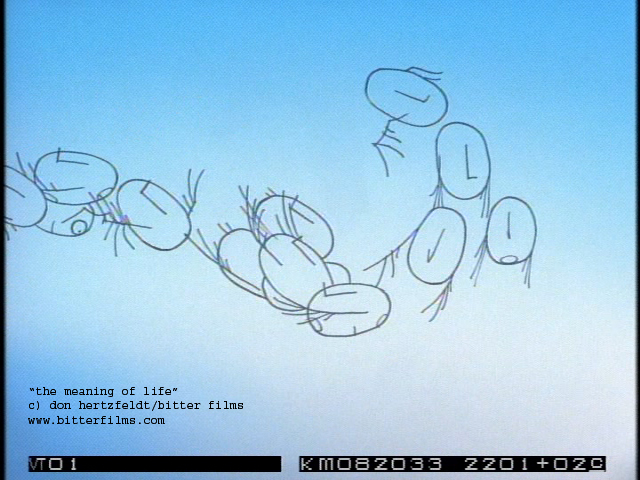 tim: aleal says: M. Hertzfeldt: How much of the exaggerated violence, as seen in Rejected, will be in Meaning of Life? May one presume it would serve a different purpose here? tim: mel allen sink says: can you explain why film is better than computer? tim: doomedmonkey says: Do you think you ever want to draw a realistic movie? tim: orodreth says: Do you think that aspiring animators should start with film or computers? tim: stevo says: What kind of 35mm film do you shoot on? tim: broken says: Don, will you ever attempt a feature-length animated film? tim: nofetusjesus says: would you say that you learned more from experience or from being taught in classes? tim: zach says: Is there anyone specific that has particularly inspired you? tim: garett strickla says: don, will we ever see bill again, or any of the other anesthetics material, for that matter? don: i think i get more out of kubrick's films than anyone else's..
tim: shandlanos says: Would working through a studio infringe on your creativity? don: there is a particular cut in MOL that rebecca and i worked on yesterday that hit me upside the head as particularly kubrickian..
tim: brachavich says: I read that you wanted to be an animator but thought you couldn't draw (I disagree) you help me to address my daughter who wants to be a choreogapher but wont take dance. Now I say "Just go for it!" tim: broken says: Have you ever thought of collaberating on a film with someone like Bill Plympton? tim: shandlanos says: What hapened to your plans for an Anesthetics book? don: bill and i collaborated on a mini tour of our films called the don and bill show back in 2001... i also did a voice for his new feature..
tim: hbthingy says: Will the fluffy thing make another appearance again in the coming years? tim: thenorman says: Will you be voting in this upcoming election? tim: ben says: I can't afford to produce film, but i'm interested in experimenting with animation. 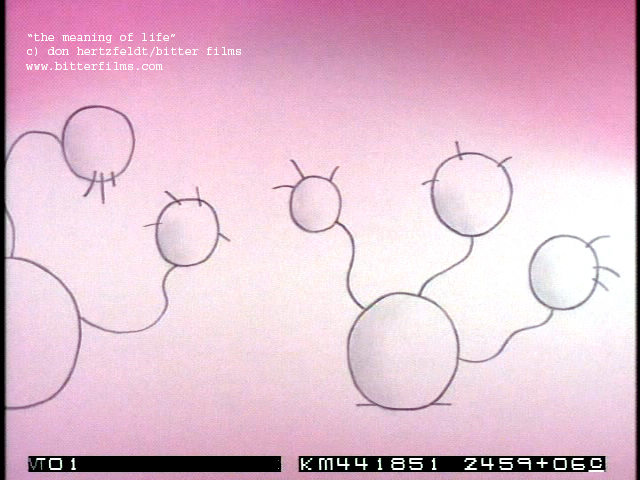 what type of camcorder did, or do, you use to get single frames on pencil tests? tim: garett strickla says: don - i really enjoy the 'rrrrrr' page. i'd love to see you do something more with it as an idea - perhaps as a book or some such thing. have you given any thought to something like that? tim: aleal says: Speaking of voting, what's your view of filmmaking in general and animation in particular as a tool to present political ideas? Have you considered doing such a thing with your work? don: at the same time i figured what do i know about writing a book, why not adapt this into the next film somehow..
tim: broken says: I have a 51 minute animated film, any advice? don: backtracking a bit to a question i did not answer..
tim: mel allen sink says: what's you feelings about flash animation? don: it will not be released as another "single"
tim: joeibanez says: do you think film school is essential to the success of a filmmaker? tim: aneurysm says: Doyou ever get distracted with other things when trying to work on a film? If so, how do you get yourself back on track with production? tim: george says: Are you more afraid of death or going bald? don: i don't think film school is essential, no.. but education is never a bad thing. at the very least you might meet some very great people. tim: ghoest says: How many people work with you at biter films? tim: george says: Any concerns that high definition will force a change in the production tools you use? 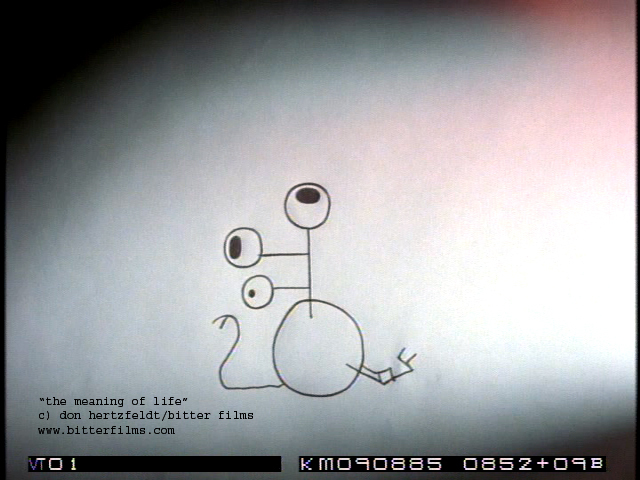 don: would you like to see a couple more pictures from "the meaning of life" ? don: there you have it..
don: new technology like high definition so far has been only helping us..
tim: shandlanos says: Would you consider taking on an indetured servant? tim: doomedmonkey says: Do people stop you on the street and say "Hey, you're Don Hertzfeldt"
tim: stevo says: Is there a reduction in picture quality when using computers to edit? tim: garett strickla says: do you think you'll still be making these shorts when you're 50? is there any desire to more on to bigger and/or better things? tim: mel allen sink says: what are those things that you can do with film that you can't do with computers? tim: zach says: what size (of paper) do you usually work on? don: ok tim i think we have time for a few more questions...? tim: liam says: how are you funded / how are you able to eat? tim: broken says: What film festivals would you recommend a new animator? tim: aleal says: Regarding Animation Show Year 2, any probability that offbeat, older animation (like Ward Kimball's Mars stuff in Year 1) will be included? tim: zach says: where do you stand on the subject of anime? good? bad? stupid? tim: garett strickla says: do you get nervous about being pigeonholed as 'that guy who does the stick-figures'? have you ever considered expanding or altering your aesthetic? don: i am a bit unlearned the ways of anime... i know a little bit but not as much as i'd like to. tim: broken says: Any advice on how to get a distribution deal? don: i think after the new film is out i won't be very easily pigeonholed as anything anymore..
bye bye don, its been a pleasure! monkeyforahead: break a leg on MoL! zach: keep up the awesome work!!! doomedmonkey: You're the greatest person ever, thank you. shandlanos: I won't make out with you but I know many underage girls who will! thy: looking forward to your next resurfacing!